Scorsese’s Casino is a modern classic. I am assuming that anyone thinking about buying the Blu-ray has already seen the film, so I am simply going to say it is a story of two Chicago friends that come to 1973 Vegas to make their fame and fortune. Over the course of time, fortunes change and the inevitable conflict occur. There is much to praise about Casino: Robert De Niro and Joe Pesci each deliver powerhouse performances that will know your socks off. Also bringing their A game are supporting cast members Sharon Stone (In perhaps the one really good performance of her career), James Woods, Kevin Pollack and Don Rickles. Vegas is the ideal setting to showcase the magic of high definition television. The lights and colors really pop, giving your eyes an absolute feast. The contrast between the darkness of night and the Vegas lights is sharp. Scrosese is known as a director with an eye for detail and that lends itself to this format. Watching Casino, I felt like every shot was carefully planned out for my viewing pleasure. There is a desert scene, where Nicky and Ace meet, that is gorgeous. There are moments that could be frame as art. Credit certainly must go to Scorsese and his cinematographer for framing it the way they did, but in HD, the mountains, the shrubs and whatnot look great. I did notice the occasional bit of grain and whatnot, but not enough to detract from the viewing experience. Most of it was in the daylight scenes, so I wonder if some clean up was done in the darker shots. The audio is also a delight. Casino makes excellent use of music. The Stones, BB King and Fleetwood Mac are among the artists that fill the room during the film. There is something that seems a little off, but was minor enough that I could not put my finger on it. 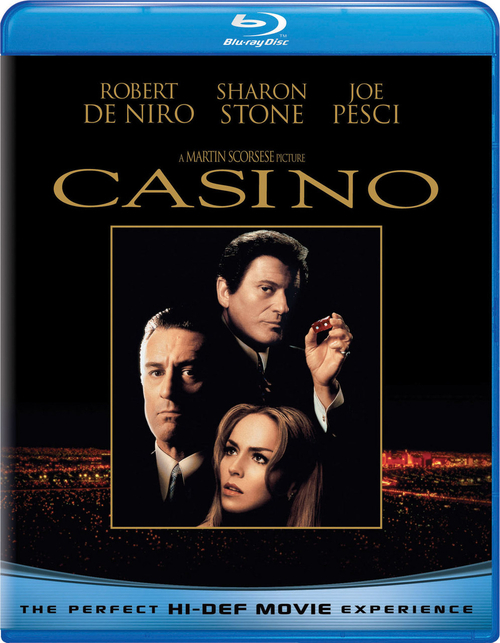 Casino is a top-notch film, with fantastic performances, that is visually a treat, especially here in HD. I certainly recommend it for any fan of crime drama.